(1974) "You and Me Against the World"
"You and Me Against the World" was the first song written by Kenny Ascher and Paul Williams and began as a gag song: Williams and Ascher, a member of Williams's band, had a discussion about their favorite songwriters which led to the spontaneous composition of a song on the subject whose tune, Ascher then realized, had real hit potential. Williams himself debuted "You and Me Against the World" on his 1974 album Here Comes Inspiration, singing it as a traditional love ballad. 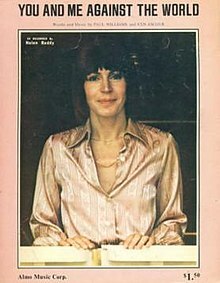 Helen Reddy considered the song's lyrics too "paternalistic" to be convincing as a woman's declaration of love for a man; instead, she interpreted the song as a mother singing to a child, which her version clarified by her daughter Traci's speaking to "Mommy" at the start and end. Released as the second single from Love Song For Jeffrey, "You and Me Against the World" reached #9 on the Billboard Hot 100 in September 1974 and became the fourth of Reddy's six consecutive Adult Contemporary Number Ones. The song did equally well in Canada. "You and Me Against the World" had also been recorded by Ann Burton, Robert Goulet, Gladys Knight and the Pips, Vera Lynn, Johnny Mathis, Matt Monro, and Matt Monro Jr. A Swedish rendering, "Du Och Jag Emot En Värld", was recorded by Lill-Babs. ^ Reddy, Helen (2006). The Woman I Am: a memoir. New York: The Penguin Group. p. 157. ISBN 1-58542-489-7. ^ Whitburn, Joel (2002). Top Adult Contemporary: 1961-2001. Record Research. p. 201. ^ "1973 Year End". Bullfrogspond.com. Retrieved 2016-10-07. This page was last edited on 21 March 2019, at 00:53 (UTC).